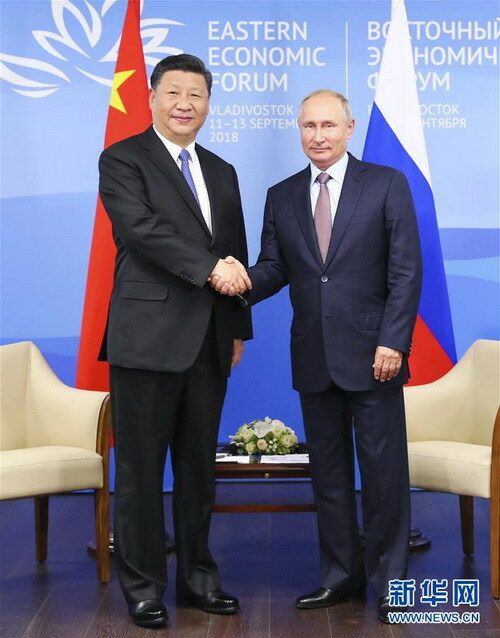 VLADIVOSTOK, Russia, Sept. 11--Chinese President Xi Jinping and his Russian counterpart, Vladimir Putin, expressed their firm determination to promote bilateral ties and safeguard world peace and stability during their talks here on Tuesday. Xi arrived in the Russian port city of Vladivostok earlier in the day for the fourth Eastern Economic Forum (EEF) at the invitation of Putin. 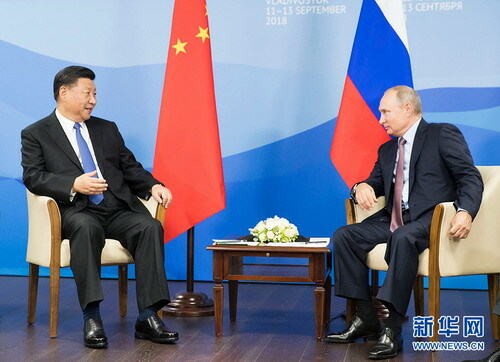 During their talks, Xi and Putin acknowledged that China-Russia ties have been developing with stronger momentum this year and have entered a new period of faster development on a higher level. Regardless of the changes in the international situation, China and Russia will unswervingly promote their ties and steadfastly safeguard world peace and stability, said the two heads of state. Recalling their productive meetings in Beijing and Johannesburg this year, Xi told Putin that the close high-level contacts between China and Russia have demonstrated the height and uniqueness of the bilateral relationship and showed that the two countries give top priority to the ties on their diplomatic agendas respectively. Thanks to joint efforts of both sides, the political advantages of China-Russia relations have been translated into tangible cooperation fruits continuously, Xi said. China and Russia have steadfastly supported each other in pursuing development paths that suit their respective national conditions and in safeguarding their security and development rights, setting an example of major-country relations and neighborhood interaction, Xi said. He urged both sides to consolidate their traditional friendship, strengthen comprehensive coordination and promote the China-Russia comprehensive strategic partnership of coordination to a new height so as to better serve the interests of both peoples. China and Russia should strengthen the synergy of the Belt and Road Initiative and the Eurasian Economic Union (EEU), expand cooperation in such fields as energy, agriculture, scientific and technological innovation and finance, promote steady implementation of major projects and boost joint research and development of cutting-edge science and technology, Xi said. Since this year and the next year are designated as the years of local cooperation and exchange between China and Russia, the two countries should seize the opportunity to encourage more local participation in bilateral cooperation, Xi said. Supporting each other in holding large-scale events has been a good tradition for China and Russia, Xi said. 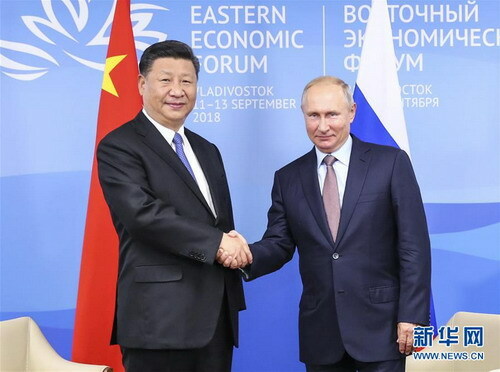 The EEF, proposed by Putin, has become an important platform for pooling wisdom and jointly discussing regional cooperation, said the Chinese president, adding that he believes this year's forum will bring new opportunities for China and Russia to deepen regional cooperation, including Far East cooperation. Both as permanent members of the United Nations (UN) Security Council and major emerging economies, China and Russia shoulder the task of safeguarding world peace and stability and promoting development and prosperity, Xi said. He urged the two countries to maintain close communication and coordination within multilateral frameworks such as the UN, the Shanghai Cooperation Organization and BRICS, push forward political settlement of hotspot issues together with the international community, and jointly protect international equity and justice, as well as world peace and stability. He also called on the two sides to firmly uphold the purposes and principles of the UN Charter, jointly oppose unilateralism and trade protectionism, and forge ahead with the construction of a new type of international relations and a community with a shared future for mankind. Putin, for his part, expressed heart-felt gratitude and warm welcome for Xi's attendance at the EEF. President Xi and I have kept close exchanges, which shows the high level of Russia-China ties, Putin said. Hailing the robust momentum of the development of bilateral ties in recent years, Putin said the mutual trust between China and Russia has grown increasingly strong and bilateral cooperation in various fields such as politics, economy and security has been fruitful. He said both sides should continue to promote the synergy of the EEU and the Belt and Road Initiative, expand cooperation in such fields as investment, energy, aerospace, finance and e-commerce, boost cultural and people-to-people exchanges and promote local cooperation. Russia and China share many similar views on the current international situation, Putin said, calling on the two countries to enhance coordination and cooperation in international affairs, firmly oppose unilateralism, safeguard a fair and rational international order and realize common development and prosperity. The two leaders also exchanged in-depth views on international and regional issues of common concern and witnessed the inking of multiple bilateral cooperation documents.